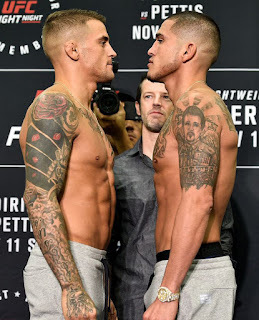 9) Versatility - Dustin Poirier has long been recognized as one of the best all-around fighters in mixed martial arts, as he has shown the skills and awareness to fight in a variety of ranges, using a variety of tools and skills. 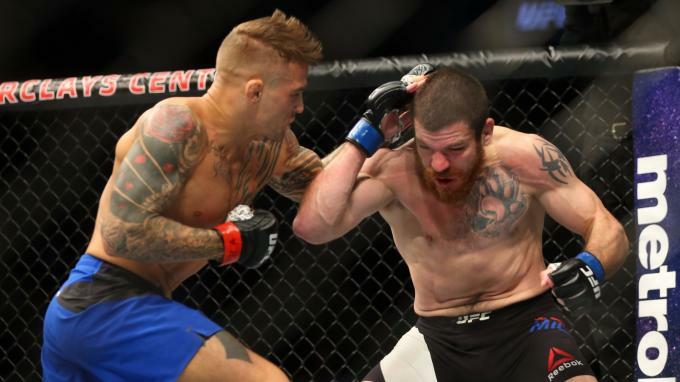 What separates Poirier from the masses of mixed martial artists is the depth of skill he has in each range, which affords him a lot of leeway in regards to what he does at each range, as well as a wider margin of error regarding how long and under what circumstances he can occupy each range. This same versatility is exhibited by pound-for-pound entrant and current UFC Flyweight Champion Demetrious “Mighty Mouse” Johnson. In both instances the fighter is able to navigate physical disadvantages or technical holes by transitioning through ranges and forcing opponents into ones where they lack the necessary physical/technical skills or mentality to be effective. 8) Fight IQ - As stated earlier, Poirier is one of the very best all-around fighters in mixed martial arts. Given the width and depth of the skills he possesses, it’s peculiar that he hasn’t challenged for or won a title in either of the two divisions he has competed. You could point to athleticism, except that Poirier is clearly above average in areas of strength, explosiveness, durability, cardio, speed, and power. He is only really outclassed by the best athletes in the division, the same guys everyone else is outclassed by. Nonetheless, he has enough in each category to compete with better athletes, especially when combined with his overall skillset. Experience and quality of training can’t be an issue, as he trains out of one of the best gyms in the world (top five at worst), so he is getting reps with and sparring against top level athletes/fighters. On top of that, he is one of the most active and experienced guys in two divisions, facing the best physical, technical, and strategic talents in both. But the one thing that has continuously derailed Poirier is his fight IQ. He has no really glaring holes in his fight game; what he has is an inability to maintain the poise needed to take full advantage of his unique combination of technical and physical tools. In a fight with Conor McGregor, Poirier chose to engage in a striking contest against the Irishman, even though he has historically been exposed as a much less effective defensive wrestler and grappler. 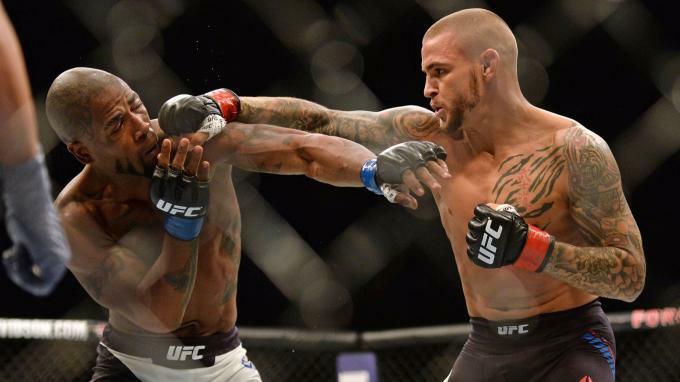 In a fight against the highly ranked lightweight Michael Johnson, Poirier allowed the notoriously reckless talk from Johnson get under his skin, leading him to engage in a firefight that played to the strengths to the more dynamic and harder-hitting athlete in Johnson. 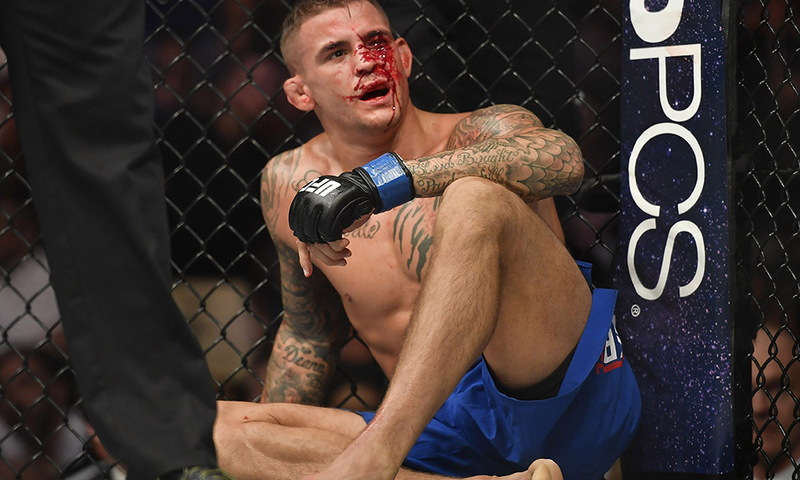 In both cases, Poirier chose a less likely path to success when he had the skills to take any number of avenues, and suffered two stoppage losses as a result. In his most recent outing, facing former lightweight champion Eddie Alvarez, Poirier essentially ran a mixed martial arts clinic on Alvarez. Outclassing the faded veteran in regards to athleticism and technique, Poirier showed quicker feet and hands, and better reaction time, all the while manipulating the range of attacks and counters. After easily leading, countering, and defending against Alvarez, he allowed himself to get dragged into an all-out brawl that resulted in a no-contest after he was hit with an illegal knee on the ground from Alvarez. In multiple fights Poirier had clear advantages and lost -- in the biggest spots, against the best opponents, and on the biggest stages. Much like Demetrious Johnson, Poirier prefers to fight and excels in the clinch. His footwork in tight spaces is sublime; he can sidestep, pivot, and cut angles beautifully while moving his head. This allows him to maintain his defensive responsibility, keeping himself safe in the clinch while at the same time allowing him to control the pace and place of the engagement, as he disrupts his opponents’ balance and positioning, forcing them to reset. It affords Poirier control over when and how an opponent’s weapons are used, providing free reign to use any combination of punches, knees, and elbows, as well as a variety of trips and body lock takedowns. What is different about Poirier and his preference for clinch work is that, like Johnson, he is able to use measured footwork when applying pressure, enabling him to gain clean entries into the clinch. Using sharp angles, well-timed pivots, and subtle head movement, Poirier is able to limit his opponents’ ability to fire shots (strikes or takedowns); this allows him to push them back with his own series of strikes. It also allows him to use any attempt to stop his forward pressure with leads or counters as a bridge to enter into the clinch and get his hands on an opponent. On the ground, Poirier has demonstrated surprisingly suffocating top control, as well as an efficiently punishing array of ground strikes (see the Joe Duffy fight), only surpassed by his slick series of submissions in transition. 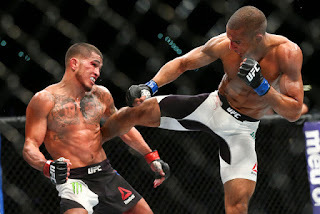 6) Underrated toughness - When discussing Anthony Pettis, words like dynamic, creative, fast, talented, and offensive are all used; these highlight the physical gifts he has been blessed with and the variety of ways he takes advantage of them in the course of a mixed martial arts fight. But what is rarely given any attention is the mental and physical toughness that accompanies these other gifts he possesses. In ten and a half years of fighting; essentially fighting the best prospects and veterans in the world, he has only been stopped once. That stoppage loss came as a weight-drained Pettis, who missed weight and forfeited his opportunity to fight for the featherweight title, faced Max “Blessed” Holloway, a fighter known for the blistering pace he sets and the ridiculous amount of volume he generates. The current UFC Featherweight Champion and owner of the longest win streak in the division outworked Pettis and won by stoppage as a result of strikes, namely body shots. Outside of that “freak” occurrence, “Showtime has shown himself to be among the most durable and mentally resilient fighters in mixed martial arts. The list of fighters who couldn’t find a way to stop him inside the distance is rather impressive: Rafael Dos Anjos, Edson Barboza, Charles Oliveira, Eddie Alvarez, Bart Palaszewski, Benson Henderson, Donald Cerrone, Jim Miller, Joe Lauzon, Jeremy Stephens, Gilbert Melendez. These are the types of fighters who have made careers out of physically eliminating threats or mentally breaking them, and none of them were able to get the job done against Pettis. 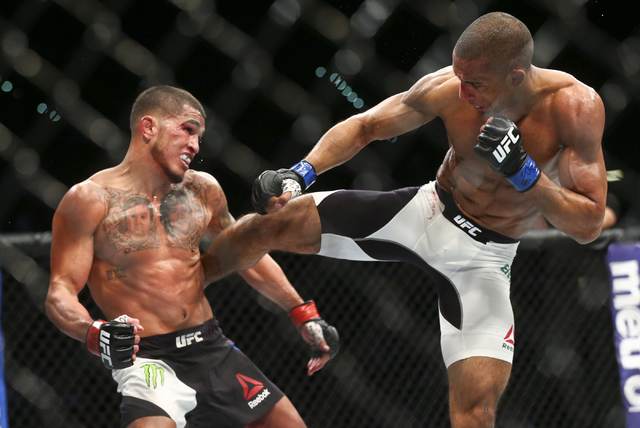 Some people feel injuries and inactivity have resulted in some decline for Pettis athletically, but his in-fight physical and mental toughness remains world class. 5) R-E-S-P-E-C-T - The secret to Pettis’s success is directly related to this word. He has a reputation as a once in a lifetime talent offensively, but his defense has been historically bad -- not TJ Dillashaw bad, but pretty bad nonetheless. The point I am trying to make is guys saw Pettis fight and went into fights looking to avoid certain weapons and situations, instead of trying to figure out how to put him in situations to best use their own weapons. This RESPECT both allowed Pettis to work at a pace he preferred, and provided him with a lack of pressure that allowed for a more offensively wide open attack in terms of creativity and intensity. Guys weren’t willing to consistently pressure, exchange, or get physical with Pettis; they would make attempts, but when he didn’t immediately fold or change strategies, they would lower their offensive intensity and workrate. When faced with fighters who refused to capitulate in the face of his unique blend of physical tools and offensive wizardry, Pettis was often pushed at best (vs. Henderson) or defeated at worst (vs. Dos Anjos/Barboza/Alvarez/Holloway). Pettis is much like former middleweight champion Luke Rockhold, in that the reputation of what he has done forces guys to be more cautious, which ironically allows him to do all the things they are fearful of him doing in the first place. Rockhold took longer to be found out because the array of physical gifts he possesses, especially at his weight, are much more pronounced than the advantages Pettis has. On the other hand, Anthony Pettis, unlike Luke Rockhold has consistently shown world class durability and a willingness to engage at any range, regardless of the amount of pressure or physicality being exhibited; Pettis’s efficiency may suffer, but his willingness to bite down and engage never does. 4) Becoming Jim Miller - Poirier is a well-rounded fighter, a world class fighter, and has been so in two divisions. Few guys have his resume, level of experience, or skill. He is a guy who is faced every type of fighter, every style of fighter, every caliber, every level of experience, IQ, and savvy. But he hasn’t been able to consistently defeat the best guys in either division, and in the biggest spots he has underperformed. That doesn’t sound like an elite fighter; it sounds like a guy who is close to becoming -- if he isn’t already -- a journeyman. If you read a previous article I did, prior to the Pettis vs Jim Miller fight, you will notice some stunning similarities between the established journeyman Miller and the current “elite” fighter Poirier. “The Diamond” may not be solidified as a journeyman yet, but he isn’t that far away either, and another loss could very well put coffin nails into his career as a legitimate top ranked fighter and potential title challenger. 3) Lack of cohesion - Much like Luke Rockhold, Pettis is still learning how to develop a truly fluid and well-connected fight game; his physical tools are still elite and his overall game is still dynamic, but it lacks any sort of cohesion. He has too many gaps in his game -- the footwork doesn’t line up with his wide open striking game, the defense doesn’t line up with or work in coordination with his offense, and the tactics don’t always line up with the situations Pettis puts himself in or finds himself in. In many cases, his durability, athleticism, power, and creativity offensively fills the gaps he has in the areas of defensive footwork, lack of consistent punch combinations, limited shot selection with the hands, defensive wrestling, and ability to consistently maintain pressure or volume. Pettis has improved, but given the activity he has and the caliber of opposition, he is still in the process of diversifying and developing the finer, connective points of his game. He leans on his physical tools a little less, but his skills and his approach are still defined by those physical tools. 2) This is a crossroads fight - Both fighters have been inconsistent in the past few years, and this fight is another step in the right direction for one of them to reassert himself as a legitimately top ranked lightweight. A win can reestablish either fighter as a factor in the division and for title contention down the line. But a loss takes Poirier from legitimate title contender to journeyman, and a loss by Pettis takes the shine off of his win over Miller. And long term, that could take him from a name in the rankings to a name on some up-and-coming fighter’s resume. 1) Miller redux - This fight mirrors the Miller fight, in that Pettis is facing a better martial artist and all-around fighter, but is once again facing a fighter who is not as accomplished, nor is he as gifted as Pettis (even this version of Pettis). He is still the more dynamic, creative, and offensively effective fighter. More importantly, he is the better athlete, the bigger hitter, and MOST importantly, the more durable fighter. 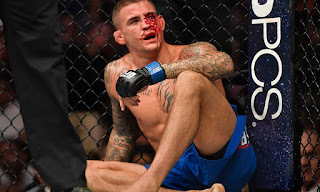 Pettis may lack urgency and have somewhat disconnected (but improving) offense and defense; but Poirier is a guy who will fight against his best interests and make mistakes, even when he isn’t being forced into making them. Pettis has a bigger margin of error via his athleticism and durability, and that will make the difference; Poirier’s inability to fight clean results in him getting into the kind of fights he doesn’t seem suited for at this point in his career. Pettis may not fight in the most technical and strategically aware manner, but he has never fought against his best interest purposely. 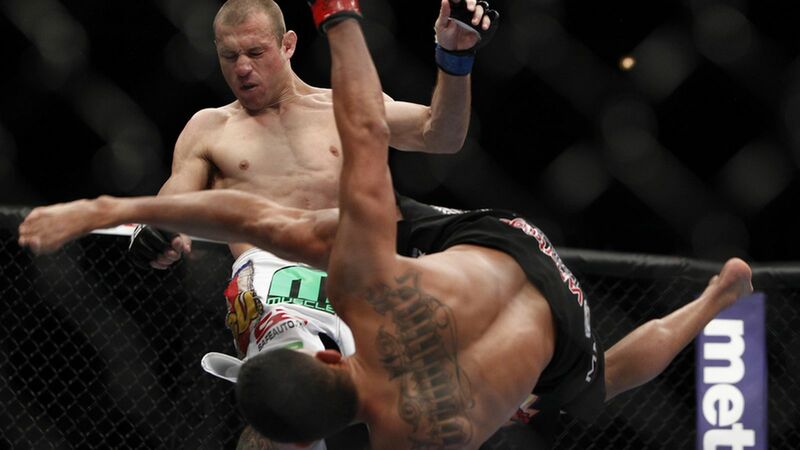 Poirier has done so repeatedly, and before it only cost him against the very best. Now it’s beginning to cost him against second-tier fighters and journeymen. 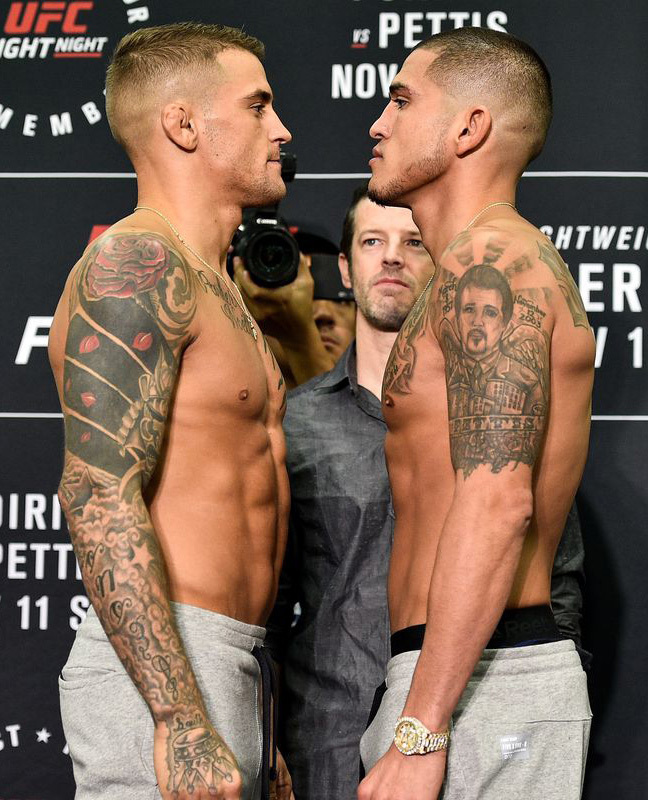 Tonight Anthony Pettis will stand across the cage from Dustin Poirier, both fighters attempting to change the narrative on their respective careers. Poirier is out to show he is still a top ranked fighter in regard to in-fight performance, not just past accomplishments. Pettis is out to prove he’s still “Showtime,” and a win helps him take another step in his slow ascension back to the top. A loss for either fighter doesn’t end the discussion, but it makes it a really hard one to have.